« Older: Back to back Championship: SPHS Male Softball Team wins nationals! With only four weeks remaining in the Pepsi National Elite Basketball League (NEBL) regular season, the San Pedro Tiger Sharks are looking to advance to the playoffs. However, after a recent 69-71 loss to the Belmopan Bandits, they have dropped to third place with 12 accumulative points, while Cayo Western Ballaz is tied with the Belmopan Bandits with 13 points in the league. 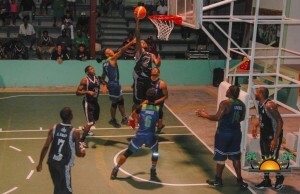 On Thursday, March 16th, the Tiger Sharks faced the Belmopan Bandits at the University of the Belize’s (UB) gymnasium. The Tiger Sharks took a 13-10 lead in the first quarter. During an intense match in the second quarter, the Bandits went to halftime leading with three points. In the third quarter, the Tiger Sharks made a comeback, gaining a five-point lead, 56-51. In the last seconds of the game, the Tiger Sharks attempted to tie the game and head to overtime, but fell short of a two-pointer, causing the Bandits to win 71-69. On Friday, March 17th, the Cayo Western Ballaz faced the Smart Belize Hurricanes at the Sacred Heart College Auditorium. The Ballaz easily overcame their opponent 82-78. The last game of the weekend took place on Saturday, March 18th at the Orange Walk Multipurpose Complex. The match was intense, but Orange Walk Running Rebels still managed to emerge victorious over the Dangrigra Dream Ballers with a final 75-71 score.